I see Evan credits Henry Hook and Merl Reagle (R.I.P. both) with pioneering the “Something Different” puzzle. I did not know that. I associate this kind of wackadoodle puzzle with Trip Payne, who seemed to make one annually for Peter Gordon’s “Fireball” crossword, and possibly before that. 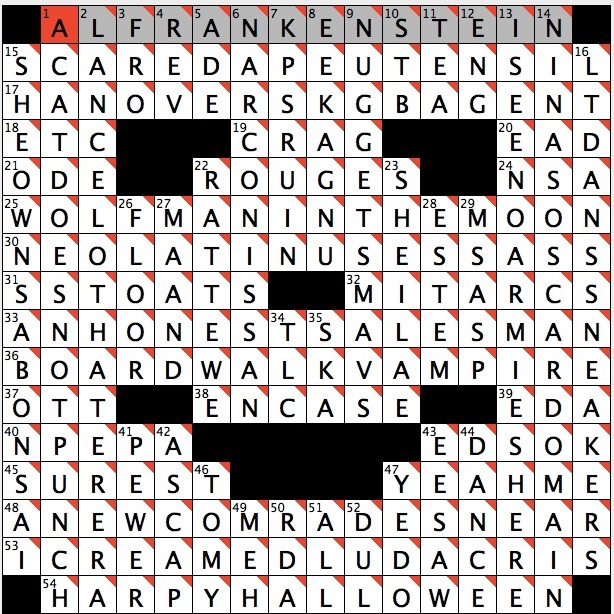 I don’t remember those puzzles ever being themed, though, so this one adds a new twist—with a jack-o-lantern grid and four long, wacky Halloween-themed answers. I would love to see more puzzles like this. They are a ton of fun to puzzle out, and they allow constructors to write clues that are absolutely bananas. Sometimes the wackiness can be overwhelming, almost numbing, but not nearly as numbing as a grid full of familiar or awkward fill trying to pass itself off as valid. One big (and unexpected) takeaway from this is how natural and in-the-language two team names back-to-back feels, as a way of describing matches / games. NUGGETS-MAVS is exactly how (briefly) a TV promo would describe the match-up. ” … then NUGGETS-MAVS at 10pm.” Obviously the pairing is entirely arbitrary, as it almost always would be, but still: it’s definitely a Real way of expressing sports matchups (9D: Brief description of the matchup between Denver’s and Dallas’s N.B.A. teams). Thanks for the review, Rex! Every time I’ve made one of these, I’m pretty sure I’ve said something like “I can’t decide if [insert bizarre answer here] is the best or worst thing in this grid.” There has to be a category or term for that kind of answer, something that’s simultaneously great and ugly — grugly? — but my candidate for this would have been SST OATS. And actually, it was from Trip that I learned that Henry and Merl had a hand in creating the Something Different, though you’re right that Trip has basically made it his own specialty.